What a glorious weekend we had in Wales. A chance to take all the grandchildren on P’s side off to a very rustic and beautiful campsite near Llandridnod Wells. Very basic facilities, an eco-camp. 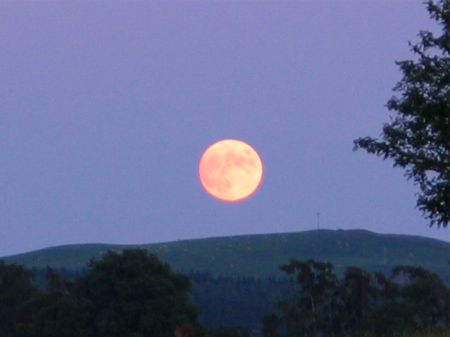 The full moon came up over the horizon and I’d never seen such a gorgeous moonrise before. The children had a riot and a good time was had by all. I’m sitting on the boat where we’re staying in Poplar Dock in London for a few days. We’re in town for a week of sabar drumming evening classes with our teacher Modou Diouf from Senegal. London is very sunny and hot and I hope it stays nice as we’re off family camping in Wales on the weekend. We had a great time in Bristol the other weekend, went to a gig, a mini-festival and the Bristol Refugee Day in the park with some lively African bands and other performers from countries where people find themselves persecuted in various ways – we are very lucky here to have such relative freedoms. We’ve also been watching the abysmal England World Cup matches – let’s say no more about that – it’s too depressing! Let’s hope tomorrow’s match is better – it couldn’t really be worse – unless you are North Korea of course! Anyway – got to go now – sorry it’s been so long – I’ll be back! 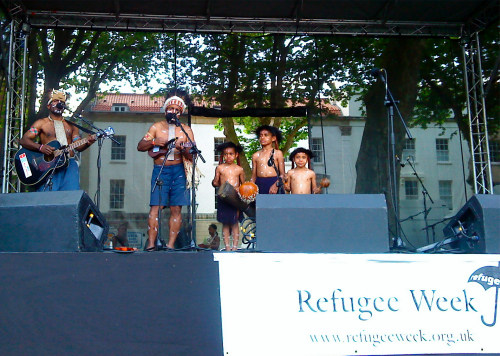 Here’s a picture of a band which was singing about the problems the indigeonous people from the West Papuan Islands suffer. I don’t really know where to start with this post – too much to try and cover in a short post! We were on site on and off from Weds till Monday and the event was a great success. The format was people could arrive from the Friday night and get their camping gear set up and have a meal. Saturday all day there were amazing performances of West African music from both students and professional artists. Each person could do one workshop of their choice in one of the marquees or in the main barn area for African dancing. Apart from one or two things – the whole thing went off without a hitch and we’re hoping to do a longer event next year depending on a venue. This is us playing as part of Sankofa – a UK sabar group. I can’t believe so much time has passed since I last posted something. It’s been hectic to say the least! I’ve been to and fro from Bristol and had family staying all weekend which was lovely – especially seeing my sister who lives in Australia which is always a very special treat. Tomorrow we’re off in Moon Palace to start setting up ABC – the whole site has to be marked out, a stage built, all the preparations put in place for an amazing line up of drum and dance workshops and performances this coming weekend. It’s a real team effort (about 5 organisers and 20 crew and up to 200 punters) and if last year’s got anything to go by – it’ll be fantastic and worth all the effort. I’ll try and get some photos in between everything else and see you all next week!